"Although they hire African Americans and Latinos as campaign workers, the vast majority are herded into race-specific positions where they are expected to interact with the public, offered no meaningful chance for advancement, and receive less favorable treatment than their white counterparts who engage with, as the campaign sees it, a more desirable constituency," the complaint says. 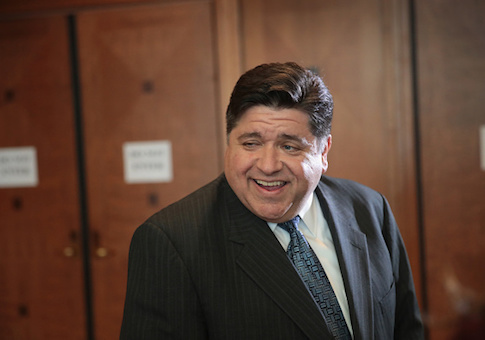 The lawsuit comes just weeks before Pritzker will face Republican incumbent Bruce Rauner in one of the most expensive state elections in national history. The complaint also alleges that the campaign placed minority staffers in "unsafe locations," placing them in danger. The lawsuit says that the campaign workers asked when Pritzker would visit their office. They say the campaign responded, "He’ll visit when they stop shooting." Pritzker’s campaign was not immediately available for comment, but Pritzker’s Lt. Gov. candidate, Juliana Stratton, said in a statement that "we had a letter delivered to us asking for $7.5 million dollars in 24 hours or they threatened legal action and to go to press. That’s not a good faith effort." Shay Allen, a Chicago-based civil rights attorney who represents the plaintiffs, says Stratton's statement is false, adding that Stratton has never reached out to any of his clients despite their complaints to the campaign. "I have no idea how the person who made that statement could make those claims," he said. "I'm positive that she's never spoken to my plaintiffs." Allen said his clients were treated poorly. "There were instances where they were spoken to very unprofessionally," he said. "There were instances of physical intimidation." Allen said his clients are asking for more effort on behalf of Pritzker's campaign to include minorities in positions of consequence, something he claims has almost exclusively gone to white staffers. "Almost all of them have prior [campaign] experience," he said. "A couple have come from other states to help with the campaign." Illinois Republican Party Executive Director Travis Sterling said Pritzker must answer for his actions. "Here, we have his own staffers – seasoned political operatives – alleging racial discrimination and harassment," Sterling said. "We have heard from Pritzker's own mouth referring to black elected officials as ‘offensive' on an FBI wiretap with Rod Blagojevich. It's finally time for J.B. Pritzker to answer for his actions." The suit was filed Tuesday in the northern federal district of Illinois. The plaintiffs, Maxwell Little, Jason Benton, Jelani Coleman, Celia Colon, Kasmine Calhoun, Erica Kimble, Nathaniel Madison, Tiffany Madison, James Tinsley, and Mark Walker, are represented by Shay T. Walker. The Chicago defense attorney’s firm represented one of the three officers that were fired for beating a man in 2015.